Timing belts are designed both for applications in diesel and petrol engines, and are fitted both on motorcars and industrial vehicles. With the use of new materials, the belts can be made in various structures and tooth profiles, to guarantee the performance of modern vehicles. NR: first generation belts, generally not subjected to high workloads nor to high thermal stress (working temperature 80°C-90°C/175°F-195°C). HSN: offers superior resistance to high working temperatures (even up to 110°C/230°F) and to pulsating loads. HDT: are foreseen for some particularly heavy applications. To increase resistance to lateral wear, they are equipped with a special fabric on the back, withstanding temperatures up to 115°C/240°F. HT: with tooth tissue coated with a PTFE film (highly abrasion-resistant material), designed to minimize wear on tooth tissue. They are mainly used on diesel engines of the latest generation and with high injection pressures: they guarantee maximum life span of the belt on the engines, withstanding temperatures up to 120°C/250°F. HK: latest generation product, equipped with aramid-based fibers for superior durability and noiselessness. They resist temperatures up to 120°C/250°F. BIO: distribution belts designed to work in an oil bath. They resist the action of additives and the high temperatures of the engine oil. The latest engines, in particular diesel engines fitted with the last-generation Common-Rail system, are particularly critical. They subject the transmission components to high mechanical stress due to high operating temperatures, high specific powers and very high injection pressures (over 2000 bar), often combined with twin camshaft timing systems. HT timing belts are Dayco’s solution: they guarantee the efficient and constant coupling between the various components of the transmission, even in case of high mechanical stresses, making use of advanced materials and a special PTFE film that is coupled with the teeth covering fabric. The HT belt can be easily identified with its unique white covering on the internal side, resulting from the presence of the PTFE film, an exclusive Dayco patent. With this new technology, Dayco has succeeded in increasing the belt wear resistance during meshing with the pulleys (including the back side of the belt) and by limiting the side wear caused by the contact between the belt side and the pulley flange. The engine cooling system is designed to stabilize the temperature, limiting its rise within the set limits. The cooling fluid is circulated by the water pump, which must guarantee the correct flow at every engine rotation speed. Failures in the system can cause significant damage to the engine. For this reason, it is extremely important that the water pump be systematically checked. 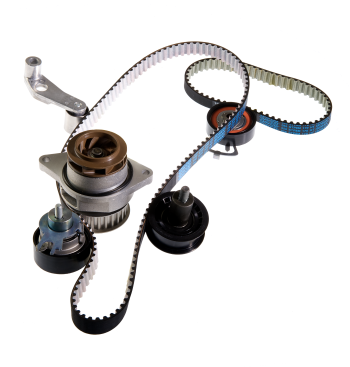 In many applications, the water pump is controlled by the timing belt. It is therefore highly important to check the water pump and replace it if necessary during the timing control maintenance. The bearing, which supports the rotor on one side and the pulley on the other side. This element must guarantee constant smoothness and react to the loads generated by the control system. It is available with a double ring of balls or a ring of balls (rotor side) and a ring of rollers (pulley side). The bearing geometry is determined by the vehicle manufacturer according to the loads generated by the system. The rotor, which can be a synthetic material is reinforced with glass fiber, steel or cast iron. The profile of the tabs is very important as they must guarantee the correct flow and prevent cavitation effects. The rotor manufacture is extremely complex as it must provide the fluid constant flow at any engine rotation speed. The seal, fitted between the rotor and the bearing. It must guarantee the liquid tightness at all operating temperatures and rotation speeds, in order to prevent the liquid from entering the bearing, causing irreversible damage to the pump. The pump body, usually in plastic or aluminium depending on the vehicle manufacturer. In both versions, the pump body must guarantee the system appropriate rigidity and geometry. The water pumps in our kits are OE equivalent and provide maximum safety and service life. The increasing performance of engines and the growing number of auxiliary units have required significant developments in the design and choice of materials for all rigid components. This implies that both the system tensioners (fixed and automatic) and pulleys must fulfil very high quality requirements. Fixed tensioners: the final tension on the belt is applied on assembly and remains constant over time. The belt tension is therefore determined when it is assembled. In these cases, the use of the DTM Tensiometer is advised. Automatic tensioner: spring-loaded or hydraulic. These are dynamic tensioners which, once installed, can adapt to and improve the belt tensioning according to the engine stress, in any operating condition. Guide pulleys: these pulleys, with or without bracket, allow the correct guiding of the belt in its route. They are very important as they support part of the system stresses. 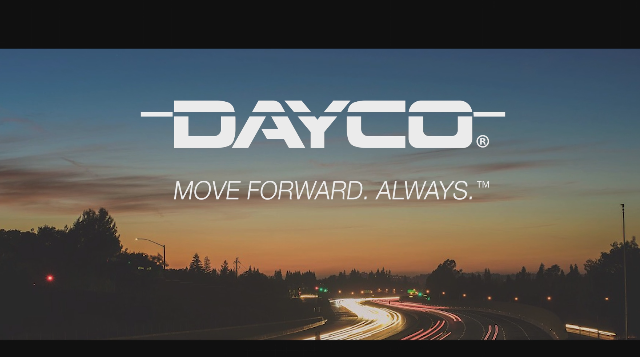 Dayco supplies components of original quality or equivalent to the original for its own range, both for automotive and industrial vehicles.